For other uses, see Basiliscus (disambiguation). Basiliscus (Latin: Flavius Basiliscus Augustus; Greek: Βασιλίσκος; d. 476/477) was Eastern Roman Emperor from 475 to 476. A member of the House of Leo, he came to power when Emperor Zeno was forced out of Constantinople by a revolt. Basiliscus was the brother of Empress Aelia Verina, who was the wife of Emperor Leo I (457–474). His relationship with the Emperor allowed him to pursue a military career that, after minor initial successes, ended in 468, when he led the disastrous Roman invasion of Vandal Africa, in one of the largest military operations of Late Antiquity. Basiliscus succeeded in seizing power in 475, exploiting the unpopularity of Emperor Zeno, the "barbarian" successor to Leo, and a plot organised by Verina that had caused Zeno to flee Constantinople. However, during his short rule, Basiliscus alienated the fundamental support of the Church and the people of Constantinople, promoting the Miaphysite christological position in opposition to the Chalcedonian faith. Also, his policy of securing his power through the appointment of loyal men to key roles antagonised many important figures in the imperial court, including his sister Verina. So, when Zeno tried to regain his empire, he found virtually no opposition, triumphantly entering Constantinople, and capturing and killing Basiliscus and his family. The struggle between Basiliscus and Zeno impeded the Eastern Roman Empire's ability to intervene in the fall of the Western Roman Empire, which happened in early September 476. When the chieftain of the Heruli, Odoacer, deposed Western Emperor Romulus Augustus, sending the imperial regalia to Constantinople, Zeno had just regained his throne, and was in no position to take any action but appoint Odoacer dux of Italy, thereby ending the Western Roman Empire. Tremissis issued in the name of Aelia Verina, wife and later widow of Emperor Leo I. As sister of Basiliscus, Verina helped him in both his military and political career – even if unwillingly supporting his bid for the purple. Likely of Balkan origin, Basiliscus was the brother of Aelia Verina, wife of Leo I. It has been argued that Basiliscus was uncle to the chieftain of the Heruli, Odoacer. This link is based on the interpretation of a fragment by John of Antioch (209.1), which states that Odoacer and Armatus, Basiliscus' nephew, were brothers. However, not all scholars accept this interpretation, since sources do not say anything about the foreign origin of Basiliscus. It is known that Basiliscus had a wife, Zenonis, and at least one son, Marcus. Basiliscus' military career started under Leo I. The Emperor conferred upon his brother-in-law the dignities of dux, or commander-in-chief, in Thrace. In this country Basiliscus led a successful military campaign against the Bulgars in 463. He succeeded Rusticius as magister militum per Thracias (464), and had several successes against the Goths and Huns (466 or 467). Basiliscus's value rose in Leo's consideration. Verina's intercession in favour of her brother helped Basiliscus' military and political career, with the conferral of the consulship in 465 and possibly of the rank of patricius. However, his rise was soon to meet a serious reversal. 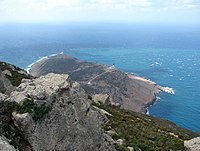 Cap Bon, in modern Tunisia is the place where the Roman fleet led by Basiliscus landed to launch an attack upon the Vandal capital of Carthage. In 468, Leo chose Basiliscus as leader of the famous military expedition against Carthage. All accounts agree that the invasion of the kingdom of the Vandals was one of the largest military undertakings recorded, although estimates of its exact size vary. According to Priscus and Nicephorus Gregoras, 100,000 ships were assembled. Modern scholars consider Cedrenus's figure of 1,113 vessels, each carrying 100 men, more likely. Peter Heather estimates a strength of 30,000 soldiers for the expedition and 50,000 total, when including sailors and the additional forces of Marcellinus and Heraclius of Edessa. The most conservative estimation for expedition expenses is of 64,000 pounds of gold, a sum that exceeded a whole year's revenue. The purpose of the operation was to punish the Vandal king Geiseric for the sacking of Rome in 455, in which the former capital of the Western Roman Empire was overwhelmed, and the Empress Licinia Eudoxia (widow of Emperor Valentinian III) and her daughters were taken as hostages. The plan was concerted between Eastern Emperor Leo, Western Emperor Anthemius, and General Marcellinus, who enjoyed independence in Illyricum. Basiliscus was ordered to sail directly to Carthage, while Marcellinus attacked and took Sardinia, and a third army, commanded by Heraclius, landed on the Libyan coast east of Carthage, making rapid progress. It appears that the combined forces met in Sicily, whence the three fleets moved at different periods. Sardinia and Libya were already conquered by Marcellinus and Heraclius, when Basiliscus cast anchor off the Promontorium Mercurii, now Cap Bon, opposite Sicily, about forty miles from Carthage. Geiseric requested Basiliscus to allow him five days to draw up the conditions of a peace. During the negotiations, Geiseric gathered his ships and suddenly attacked the Roman fleet. The Vandals had filled many vessels with combustible materials. During the night, these fire ships were propelled against the unguarded and unsuspecting Roman fleet. The Roman commanders tried to rescue some ships from destruction, but these manoeuvres were blocked by the attack of other Vandal vessels. Basiliscus fled in the heat of the battle. One half of the Roman fleet was burned, sunk, or captured, and the other half followed the fugitive Basiliscus. The whole expedition had failed. Heraclius effected his retreat through the desert into Tripolitania, holding the position for two years until recalled; Marcellinus retired to Sicily, where he was reached by Basiliscus; the general was, however, assassinated, perhaps at the instigation of Ricimer, by one of his own captains, and the king of the Vandals expressed his surprise and satisfaction that the Romans themselves would remove from the world his most formidable antagonists. After returning to Constantinople, Basiliscus hid in the church of Hagia Sophia to escape the wrath of the people and the revenge of the Emperor. By the mediation of Verina, Basiliscus obtained the Imperial pardon, and was punished merely with banishment to Heraclea Sintica, in Thrace. In 471 and 472, Basiliscus helped Leo I get rid of the Germanic influence in his court, helping in the murder of the Alan Magister militum Aspar. The death of Aspar caused a revolt in Thrace, led by the Thracian Ostrogoth Theodoric Strabo, and Basiliscus was dispatched to suppress the revolt, something he successfully did with the aid of his nephew Armatus. In 474 he received the rank of caput senatus, "first among the senators". At the death of Leo, Zeno, who was a "barbarian" of Isaurian stock, but at the same time son-in-law of Leo, became sole Emperor, after a short co-reign with his own son Leo II (474). The "barbarian" origins of the Emperor caused antipathy towards Zeno among the people of Constantinople. Furthermore, the strong Germanic portion of the military, led by Theodoric Strabo, disliked the Isaurian officers that Leo I brought to reduce his dependency on the Ostrogoths. Finally, Zeno alienated his fellow Isaurian general Illus, who was bribed by Basiliscus. In the middle of the conspiracy was Verina, who fomented a popular revolt against the Emperor. The uprising, supported by Theodoric Strabo, Illus and Armatus, was successful, and Verina convinced the Emperor to leave the city. Zeno fled to his native lands, bringing with him some of the Isaurians living in Constantinople, and the Imperial treasury. Basiliscus was then acclaimed as Augustus on 9 January 475 at the Hebdomon palace, by the palace ministers and the Senate. The mob of Constantinople got its revenge against Zeno, killing almost all of the Isaurians left in the city. In the beginning, everything seemed to go well for the new Emperor, who even tried to set up a new dynasty by conferring the title of Augusta upon his wife Aelia Zenonis and naming his son Marcus Caesar, and later Augustus; however, due to his mismanagement as emperor, Basiliscus quickly lost most of his supporters. The most urgent problem facing the new Emperor was the scarcity of resources left in the imperial treasury. Basiliscus was forced to raise heavy taxes, and to revert to the practice of auctioning the offices, obviously causing a diffuse discontent in the population. He also extorted money from the church, with the help of the Prefect Epinicus, Verina's long-time favourite. Early in his reign, Constantinople suffered a massive fire, which destroyed houses, churches, and completely incinerated the huge library built by Emperor Julian. The fire was seen as a bad omen for the rule of Basiliscus. Basiliscus had relied on the support of some major figures of the court in his bid for power. However, he quickly lost most of them. First, Basiliscus alienated his own sister Verina, executing the Magister officiorum Patricius. Patricius was the lover of Verina, and the empress had planned to raise him to the imperial rank and to marry him: the very revolt against Zeno was organised to make Patricius emperor. Basiliscus, however, had out-witted his sister, and, after the flight of Zeno, had the ministers and the Senate choose him, and not Patricius, as Emperor. Basiliscus ordered the death of Patricius, as the officer was a natural candidate to overthrow the new Emperor; as a consequence, Verina later intrigued against Basiliscus. Also, Theodoric Strabo, whose hatred of the Isaurian Zeno had compelled him to support Basiliscus' revolt, left the new Emperor's side. Basiliscus had in fact raised his own nephew Armatus, who was rumoured to be also the lover of Basiliscus' wife, to the rank of magister militum, the same that Strabo held. Finally, the support of Illus was most likely wavering, given the massacre of the Isaurians allowed by Basiliscus. In that time, the Christian faith was shaken by the conflict between Miaphysites and Chalcedonians, representing two opposing christological positions: the Chalcedonians claimed that Christ had both human and divine natures, while the Miaphysites claimed he had only one nature. The Council of Chalcedon, convoked by Emperor Marcian in 451, had ruled out Miaphysitism, with the support of the pope in the West and many bishops in the East. However, the Miaphysite position was still strong: the two Miaphysite Patriarchs Timothy Aelurus of Alexandria and Peter the Fuller of Antioch were deposed. From the beginning of his rule, Basiliscus showed his support for the Miaphysites. Zacharias Scholasticus reports how a group of Egyptian Miaphysite monks, having heard of Emperor Leo's death, had traveled from Alexandria to Constantinople to petition Zeno in favour of Timothy, but, on their arrival in the capital, they found the newly-elected Basiliscus instead. The Magister Officiorum Theoctistus, the former physician of Basiliscus, was the brother of one of the monks, so the delegation obtained an audience with Basiliscus, and, with the support of Theoctistus and of the Empress, they convinced Basiliscus to recall from exile the banished Miaphysite Patriarchs. Basiliscus re-instated Timothy Aelurus and Peter the Fuller to their sees, and, persuaded by the former, issued a circular letter (Enkyklikon) on 9 April 475 to the bishops calling them to accept as valid only the first three ecumenical synods, and reject the Council of Chalcedon. All bishops were to sign the edict. While most of the Eastern bishops accepted the letter, Patriarch Acacius of Constantinople refused, with the support of the population of the city, clearly showing his disdain towards Basiliscus by draping the icons in Hagia Sophia in black. Tremissis issued by Emperor Zeno. Soon after his elevation, Basiliscus had despatched Illus and his brother Trocundus against Zeno, who, now in his native fortresses, had resumed the life of an Isaurian chieftain. Basiliscus, however, failed to fulfill the promises he made to the two generals; furthermore, they received letters from some of the leading ministers at the court, urging them to secure the return of Zeno, for the city now preferred a restored Isaurian to a Miaphysite whose unpopularity increased with the fiscal rapacity of his ministers. During his operations in Isauria, Illus took Zeno's brother Longinus prisoner and kept him in an Isaurian fortress. Because he thought he would have great influence over a restored Zeno, he changed sides and marched with Zeno towards Constantinople in the summer of 476. When Basiliscus received news of this danger, he hastened to recall his ecclesiastical edicts and to conciliate the Patriarch and the people, but it was too late. Armatus, as magister militum, was sent with all available forces in Asia Minor, to oppose the advancing army of the Isaurians, but secret messages from Zeno, who promised to give him the title of magister militum for life and to confer the rank of Caesar on his son, induced him to betray his master. Armatus avoided the road by which Zeno was advancing and marched into Isauria by another way. This betrayal decided the fate of Basiliscus. In August 476, Zeno besieged Constantinople. The Senate opened the gates of the city to the Isaurian, allowing the deposed emperor to resume the throne. Basiliscus fled to sanctuary in a church, but he was betrayed by Acacius and surrendered himself and his family after extracting a solemn promise from Zeno not to shed their blood. Basiliscus, his wife Aelia Zenonis and his son Marcus were sent to a fortress in Cappadocia, where Zeno had them enclosed in a dry cistern, to die from exposure. Basiliscus had ruled for twenty months. He is described by sources as a successful general, but slow of understanding and easy to deceive. ^ a b c d Elton. ^ a b c d e f Smith. ^ a b c Martindale. ^ Martindale. It is also possible that he attained the rank of patricius in 471/472, for helping Leo to get rid of the Germanic influence in his court, but there is a reference to Basiliscus as patricius earlier, in 468. ^ Priscus, fragment 42; translated by Colin D. Gordon, The Age of Attila: Fifth Century Byzantium and the Barbarians (Ann Arbor: University of Michigan, 1966), p. 120f. See Gordon's note 11 on the emendation. ^ Georgius Cedrenus, through Smith. ^ Heather 2006, p. 400. ^ Procopius suggests that Geiseric supported his request for a truce with a bribe. ^ Basiliscus' lieutenant, Joannes, when overpowered by the Vandals, refused the pardon that was promised him by Genso, the son of Gaiseric, and leaped overboard in heavy armor and drowned himself in the sea. His last words were that he could not bear to surrender to those "impious dogs" of the Vandals – the Vandals, in fact, were Arians (Procopius). ^ a b c d Friell. ^ a b c d e f Bury. ^ There exists a horoscope made on the day of Basiliscus' coronation — 12 January 475, at 9 a.m. —, probably by a supporter of Zeno. The horoscope, preserved with the horoscopes of other two usurpers of Zeno through Arab sources, correctly predicts the end of Basiliscus' rule in two years. See Barton, Tamsyn (December 2002). Power and knowledge: Astrology, physiognomics, and medicine under the Roman Empire. University of Michigan Press. pp. &nbsp, 60. ISBN 0-472-08852-1. ^ Tradition allowed the Senate to recognise a usurper; thus, Basiliscus was the new lawful ruler, albeit Julius Nepos, who technically had become senior emperor, refused to accept Basiliscus as his colleague. However, it was the first military-based succession in the last one hundred years (Friell). 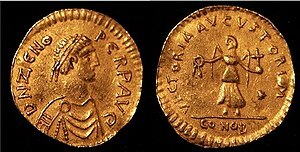 ^ Basiliscus also issued coins celebrating the joint rule with his son Marcus; Also, gold and bronze coins were minted in honour of Aelia Zenonis, Augusta The coins bear the legend AVGGG, with the three 'G' referring to the three Augusti. See Yonge Akerman, John (2002) . A Descriptive Catalogue of Rare and Unedited Roman Coins. Adamant Media Corporation. p. 383. ISBN 1-4021-9224-X. ^ This library, which was housed within a basilica next to the underground cisterna built by Justinian I, contained 120,000 volumes, including the famous parchment, 35 m (115 ft) long, upon which were inscribed Homer's Iliad and Odyssey in golden letters. ^ Bury. According to Candidus, after the death of Patricius, Verina intrigued in favour of Zeno, but her plan was discovered by Basiliscus, and only the intercession of Armatus spared her life. ^ a b "Pope St. Simplicius", Catholic Encyclopedia. ^ According to Procopius, Armatus surrendered his army to Zeno, on the condition that Zeno would appoint Armatus' son Basiliscus as Caesar, and recognise him as successor to the throne upon his death. After Zeno had regained the Empire, he carried out his pledge to Armatus by appointing his son, named Basiliscus, Caesar, but not long afterwards he both stripped him of the office and put Armatus to death. ^ The leader of the Pannonian Goths, Theodoric the Amal (later known as Theodoric the Great) had allied to Zeno. Theodoric would have attacked Basiliscus and his Thracian Goth foederati led by Theodoric Strabo, receiving, in exchange, the title of magister militum held by Strabo and the payments previously given to the Thracian Goths. It has been suggested that Constantinople was defenseless during Zeno's siege because the Magister Militum Strabo had moved north to counter this menace. See Heather, Peter (May 1998). Goths. Blackwell Publishing. pp. &nbsp, 158–159. ISBN 0-631-20932-8. ^ Elton refers that the name of the stronghold was Limnae, while Smith has Cucusus, and Evagrius Scholasticus reports Acusus. Georgius Cedrenus (1647). Goar and Fabrot (ed.). Compendium Historiarum ab Orbe Condita ad Isaacum Comnenum (1057) (in Latin). Paris. pp. 349–350. Boardman, John (1982). The Cambridge Ancient History. Cambridge University Press. pp. &nbsp, 49. ISBN 0-521-32591-9. Bury, John Bagnall (1958) . "XII.1 The Usurpation of Basiliscus (A.D. 475‑476)". History of the Later Roman Empire. Dover Books. pp. &nbsp, 389–395. Retrieved 23 August 2006. Elton, Hugh (10 June 1998). "Flavius Basiliscus (AD 475–476)". De Imperatoribus Romanis. Archived from the original on 22 August 2006. Retrieved 23 August 2006. Friell, Gerard; Stephen Williams (December 1998). The Rome That Did Not Fall. Routledge. pp. 184–186. ISBN 0-415-15403-0. Krautschick, Stephen (1986). "Zwei Aspekte des Jahres 476". Historia (35): 344–371. Macgeorge, Penny (2003). Late Roman Warlords. Oxford University Press. pp. 284–285. ISBN 0-19-925244-0. Martindale, J.R. (1980). The Prosopography of the Later Roman Empire. Cambridge University Press. pp. 212–214. ISBN 0-521-20159-4. "Pope St. Simplicius". Catholic Encyclopedia. 1917. Archived from the original on 19 August 2006. Retrieved 23 August 2006. Samuel, Vilakuvel Cherian (2001) . The Council of Chalcedon Re-Examined. Xlibris Corporation (Reprinted ed.). Madras: Christian Literature Society. pp. 134–139. ISBN 1-4010-1644-8. Smith, William (1870). Dictionary of Greek and Roman Biography and Mythology. Boston: C. Little and J. Brown. pp. &nbsp, 466. Archived from the original on 22 August 2006. Retrieved 23 August 2006. Wikimedia Commons has media related to Basiliscus (emperor).